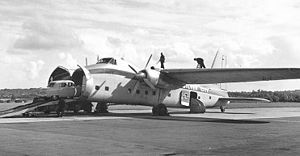 The Bristol Superfreighter was a larger, stretched version of the Bristol Freighter, still using two propeller engines. It could carry 20 passengers instead of the 12 of the smaller Freighter, and three cars instead of two in its air ferry role. The Superfreighter was distinguishable from the earlier Freighter by having a longer nose, in which the extra car was carried, and a fin fillet as well as rounded wingtips. A 1:72 scale model Superfreighter in British United Air Ferries (BUAF) livery is available from the British plastic kit manufacturer Airfix. Data from Macdonald Aircraft Handbook.